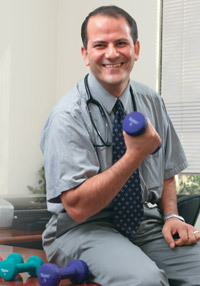 Ehsan Ghods, D.O., a family practitioner at the NorthBay Center for Primary Care in Green Valley, turns to free weights to tone his body and lift his spirits. It’s a strength-training routine he’s followed since college. Strength training offers several health benefits. A regular program can improve your balance, flexibility and stamina and also prevent injuries. Just as aerobic activity has long been known to offer cardiovascular benefits, resistance training now too has a place in heart-healthy activity programs. For older people, building strength has shown to prevent the muscle mass decline and unsteadiness once thought to be an inevitable part of aging. Studies show that people who stay strong need nursing homes at a later stage of life. But, regardless of your age, adding regular strength training to your exercise routine will fine-tune your body to perform the daily activities of living with ease. Consult with your physician before starting a strength-training program. Start with weights carefully if you’re not fit. Visit a personal trainer to learn the correct way to use the weights. Choose a weight that’s heavy enough to achieve 10 to 15 repetitions before feeling fatigued. As your strength increases, raise the number of repetitions for each exercise. Exercise in a rhythmical manner, at a controlled slow or medium speed. Remember to breathe, don’t hold your breath. Concentrate on technique and good body mechanics. Use your full range of motion. Limit your strength training to three days a week.